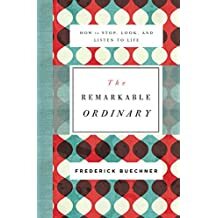 The Remarkable Ordinary shows us how to stop, look and listen to life. If you are feeling like your life is dull, boring and nothing exciting a new happens, this book is for you. It gives us a whole new perspective on how to look at life by stopping, looking and listening in a whole new way. My favorite section in the book talks about how words of literature are saying to us to stop! Stop thinking, stop expecting, stop living in the past, stop living in the future, stop doing anything and just pay attention to "this". Stop whatever else you are doing and notice. He referred to a frog haiku, which he explained we should notice actions as we walk along a path and not get caughter up in our own thoughts and pay attention to the world around us. His writing is very thought provoking and his stories of his own life and others illustrate the remarkable ordinary charactristics of everyday things. His writes as if he is writing and talking directly to you. Excellent. I really enjoyed this book and highly recommend it. 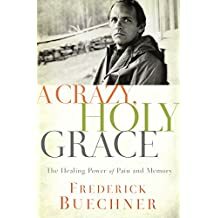 A Crazy, Holy Grace is a collection of essays that is written to help us realize that our memories can be a great healing tool for our pain and loss. We sometimes wonder why we have to experience pain and if anyone really cares. Frederick gives us some new insite to that. This was sometimes hard to read but it opened up a whole new way of thinking about pain and loss. I appreciate the fact that he used stories of his own pain and loss to present this book. I received my copy of these books from Handlebar Publishing in exchange for this honest review. All opinions are my own.